This species is the focus of some differing opinions. Two forms of the plant were found in Japan and they were given different names as if they were naturally occurring forms of a single species. Here is a brief summary of the debate (as I understand it anyway). 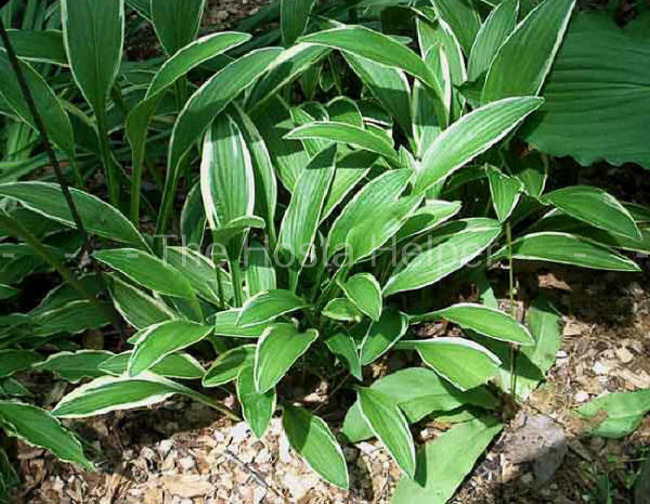 [A] One of these hostas was known as H. rohdeifolia forma rohdeifolia. In the book The Genus Hostaby W. George Schmid (1991), it was determined that this plant did not come from the wild but, rather, came from cultivation. Therefore, it was "downgraded" to cultivar status and is to be known as H. rohdeifolia 'Rohdeifolia'. It is not a species. In the The Hosta Handbook (2000), Mark Zilis feels that is actually the true species, Hosta rohdeifolia. [B] The other plant was named H. rohdeifolia forma viridis and was known in Japan as the "green-leaved hosta with leaves like Rohdea". Schmid says that this is the true species, H. rohdeifolia. Either way, we are talking about a medium size hosta (14 to 16 inches high by 12 to 16 inches wide) with a generally erect form. It has dark green foliage that is slightly convolute, oblong-lanceolate in shape. The pale purple, funnel-shape flowers with light yellow anthers bloom in August. According to The Hostapedia by Mark Zilis (2009), "...the plant grown as H. helonoides albo-picta...was actually H. rohdeifolia. In the ground, it has a rapid growth rate and is a great choice as an edging plant."